Abu Dhabi, March 18: Former Pakistan President Pervez Musharraf was hospitalised after his health condition deteriorates on Saturday. Pervez Musharraf, who is suffering from a reaction from a rare disease, was rushed a hospital in Dubai after his condition worsened, said All Pakistan Muslim League (APML) Secretary-General Mehrene Adam Malik, reported Pakistan's Dawn. 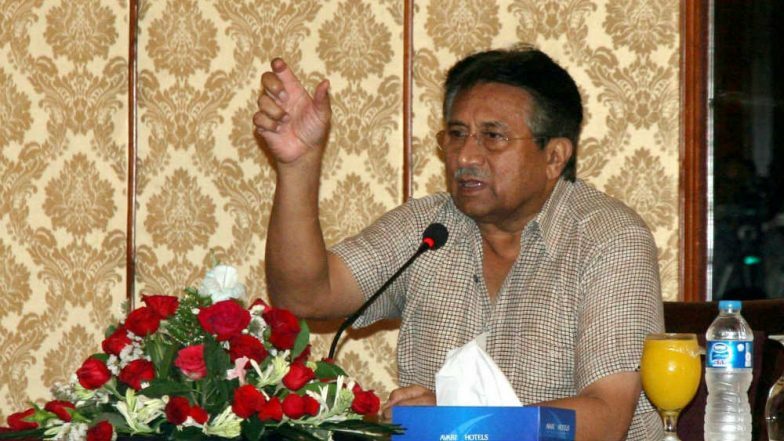 Musharraf had suffered a reaction from amyloidosis, a rare condition for which the former president was receiving treatment, APML Overseas President Afzaal Siddiqui told Dawn. According to APML, Musharraf has been advised complete bed rest by doctors till his full recovery. Musharraf's party requested Pakistanis to pray for his recovery. Musharraf's illness had surfaced last October. Pakistan SC Seeks Reply from Govt, Special Court Over Delay in Treason Case Against Pervez Musharraf. Musharraf was earlier treated in London. "Due to amyloidosis, broken protein starts getting deposited in various organs. [As a result] Pervez Musharraf has difficulty in standing and walking," Siddiqui had said at that time. Musharraf left Pakistan in March 2016 for Dubai to "seek medical treatment" and hasn't returned since. The Pakistan special court had declared Musharraf as a proclaimed offender due to his absence during the case proceedings in the past few years. Musharraf is facing treason charges filed by the Pakistan Muslim League-Nawaz (PML-N) government in 2013. The PML-N alleged that Musharraf had unlawfully suspended the constitution with the help of the military and instituted an emergency rule in the year 2007.